I posted this to the Taylorcraft discussion group, but the site seems to be far less active than SC.org with nowhere the number of active participants (SC.org ROCKS!). I hope you'll bear with me for bringing my questions here. I'm sure there's a few T-craft drivers here and it was after all once the Taylor Cub before a parting of ways between Mr. Taylor and Mr. Piper. This is my first post here. I've just purrchased <hmmm... neat typo, I think it works! ) a BEEyootiful clipped wing Taylorcraft (1946 BC-12-D). I have removed the single seat that was installed (weighing 7.12 lbs. incl. military seat belt and hardware) and am trying to figure out how to install an original sling seat. There were no instructions naturally The airplane has been highly modified from it's original configuration. I've been searching all over trying to find detailed photos of the original set-up or a set of directions for installation to no avail. I am missing the long round piece that the middle is tied onto (left to right at intersection of seat and back). Keeping everything light as possible is very important to me. The airplane will be used for competition aerobatics. The new canvas seat weighs 1.63 lbs. 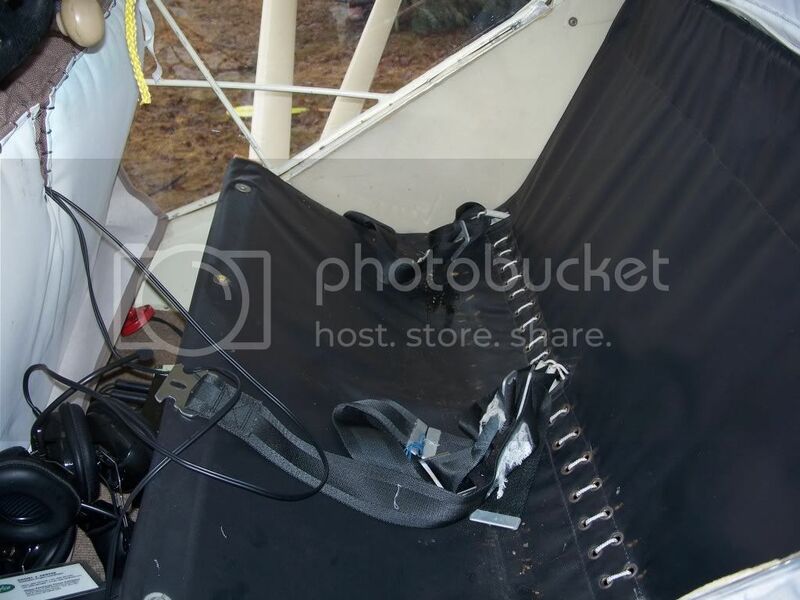 I am thinking of using a long piece of strong hollow (flexible) pvc type of pipe (gray) tied onto that portion of the canvas seat with a piece of safety cable run through the length and secured behind the seat. I can't figure out how that piece originally attached to the frame Any ideas? Know where to find original installation directions? Any pictures of how everything is attached?? I'll take a picture for you tonight and post it as soon as I can. To be fair, the responses given to your question on the Taylorcraft site should answer what you need to know. I didn't respond there myself because I could not have added anything else. Ask around & see if there's another Taylorcraft close to where you are to see the installation in person. Perhaps I was less than clear about what the question was... er... "questions are" I still haven't found the answers to a couple of my confusions. An excellent suggestion to find a stock Taylorcraft to examine. Unfortunately, the only one I was aware of nearby was sold and I'm not sure how to go about finding others (other than word of mouth). Oh well... I'm learning quickly that lotsa head-scratching and cipherin' is just another part of the job! The Taylorcraft site looks to be a good group of knowledgeable people, but lacks the handy "topic reply" notification that happens at SC.org (mebbe I just need to make a donation to the site???). It may be of help if you've got photos of what you found...detailed photos, so that a comparison can be made with what a stock Tcraft has. I am wondering what the previous owner did, mechanically, to fit the non-standard seats?